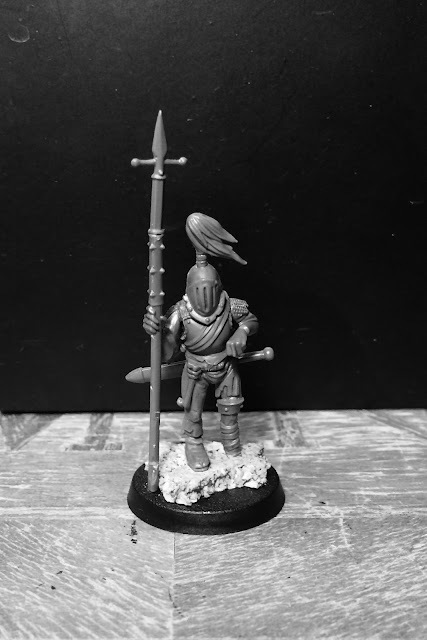 Outgard mini two ready to be painted. 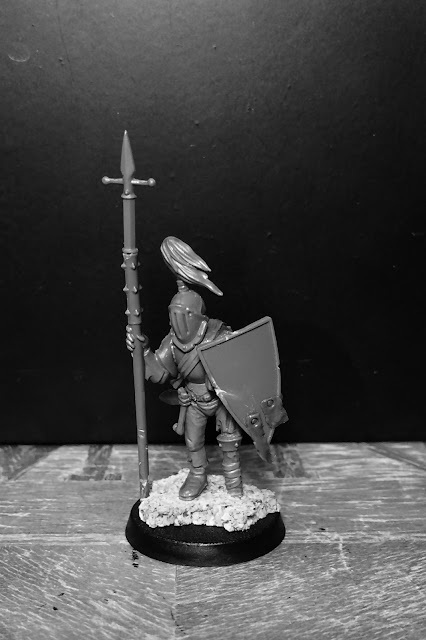 Really went to town with the "aesthetic of the pathetic" on this poor spearman (a term John Blanche always uses to describe his preference for creating huddled wretches over more powerful characters). I liked a lot this term "aesthetic of the pathetic". I believe he looks weaker with the shield on. But anyway he looks great. I think I'd go with shield-on. My reasoning for that is because, in my opinion at least, the 'hand-on-hilt' pose is one that typically expresses confidence. It could just be the different angles of the photos, but with the shield his hunch seems more pronounced; less like he's resting his arm on the sword hilt and more like he's being pulled down by the weight of his gear. I'd have to say shield on, Heretek put it rather well. In my humble opinion he would benefit from a different tip on the end of his spear. To me it just looks a little too knightly alongside the helmet. Hmm... Not sure if I´m with you there. A knight really wouldn´t have this type of spear. He´d have a lance or something similar..
Ha! I always thought I'd coined the phrase 'pathetic aesthetic' - it must have just been nestled in my subconscious for years. I like him a lot, but he needs the shield, I think. Knock some las-fire holes in it, though. It certainly looks like it's done him no good looking at his leg, so it adds to his hunch and his pathos. It probably was. I think he just lives in a part of my brain somewhere. What about a smaller round shield, so it looks like he is struggling to hold it up. One of those little arm ones, not sure if the name, buckler? This looks fantastic. It always amazes me how clean all your conversions look. Maybe mount a shield on his back? Like he carries it out of ceremony more than any practical reasons, I can't imagine he does much fighting with his injury anyway. I told him the same. Anyway he is gloriously sad looking. This reminds me of the pawns from the original battle chess game in 1988. Battlechess! I loved that game!